Bookmarks are an excellent project for beginning paper folders. They are easy to make and very practical. You can make bookmarks for yourself or slip one inside a book that you are giving as a gift. These origami bookmarks would also be useful as inexpensive party favors for a child's birthday party goody bag. The bookmark in this tutorial is made using a single square sheet of origami paper. Using paper that is roughly 6 inches x 6 inches works well, but you can experiment with different sizes to see what you like best. The paper has to be square, however. The folding instructions won't work with letter sized copy paper, for example. Since the bookmark is such a simple origami project, it offers a good opportunity to use up some of the pretty papers in your origami supply stash. To begin making your origami bookmark, place your paper on a flat surface with the white side face up. Fold it in half diagonally to make a triangle. Crease well, then unfold. Fold it in half diagonally in the opposite direction. Crease well, then unfold. When you are done, you will have an "X" crease pattern as shown in the photo to the left. Fold the top left and bottom right corners in to meet the intersection of the "X" you created in the last step. When you are finished, your paper should look like the photo to the left. Fold the paper in half up to the left along the diagonal crease. Rotate your paper so the longest edge is directly in front of you. Bring the left and right corners up to meet the center vertical crease. When this step of the project has been completed, your origami bookmark should look like the photo to the left. Flip your paper over. Tuck the top left and right flaps inside the pocket portion of the bookmark. Run your fingernail over all of the creases one last time to finish off your bookmark. 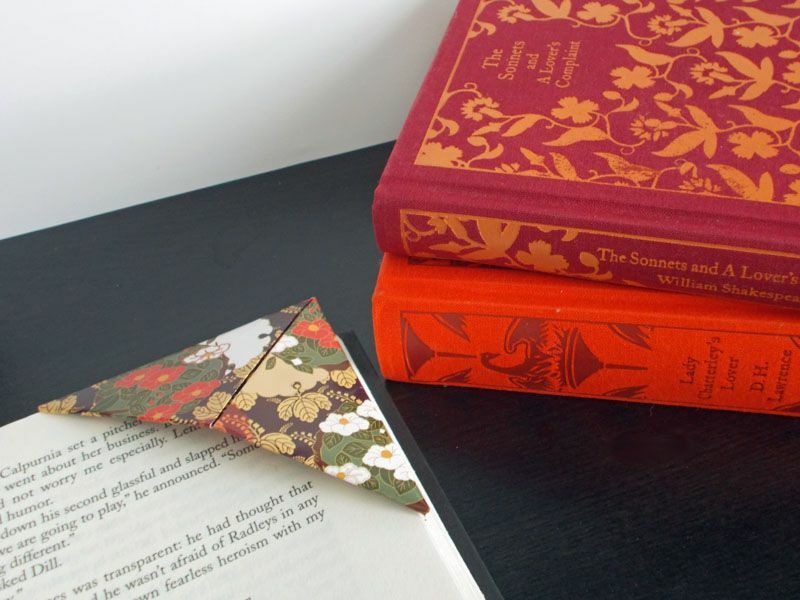 To use your origami bookmark, simply slip it over the corner of the last page you read in your book. Another good origami bookmark design is the embellished heart bookmark. This bookmark is slightly more complicated than the triangular bookmark you have just folded, but the center heart is sure to impress any avid reader.